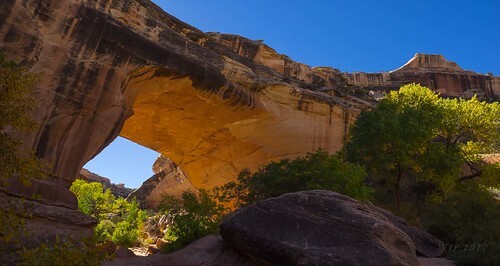 A meander natural bridge in Cedar Mesa sandstone. First named The Senator by prospector later turned ferry operator Cass Hite and party who where probably the first to see and name it historically. Shortly thereafter this bridge became locally known as the Carolyn named after cattleman Al Scorup's Mother.